Dr. Long grew up in Haven, Kansas. He went to college at Southwestern College in Winfield, KS where he played football and received all-conference honors. 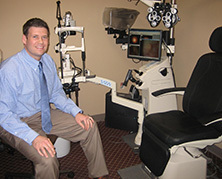 Dr. Long completed his optometric education at Northeastern State University College of Optometry (NSUCO) in Tahlequah, OK. His externship was completed at the Veterans Affairs Hospital in Muskogee, OK and focused on retinal disease. His hobbies include playing golf, fishing, and hunting. Dr. Long lives in Maumelle, AR with his wife, Natalie, and daughters Cayman and Collins.